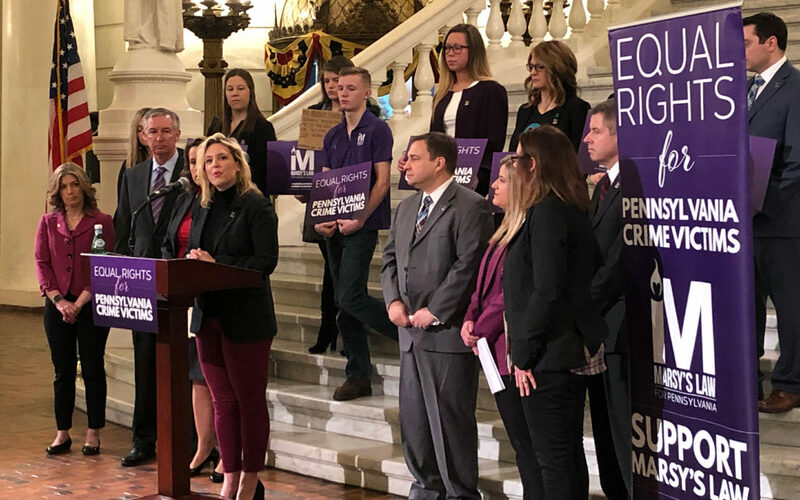 Harrisburg, PA – Sen. John Sabatina (D- Philadelphia) and Sen. Katie Muth (D-Montgomery/ Chester/ Berks) joined advocates in the Capitol rotunda to call for the passage of Marsy’s Law, which would give crime victims a constitutionally protected bill of rights. “It’s not a partisan issue, it’s a people issue,” said Sabatina, the prime sponsor of Marsy’s Law in the Senate. He said that the rights given to victims by Marsy’s Law will further strengthen the victim support system of Pennsylvania. Rep. Sheryl Delozier (R-Cumberland), who sponsored Marsy’s Law in the House, said the legislation would not give victims more rights than defendants have, it just put both victims and defendants on equal footing. “Why shouldn’t the system treat them fair and equal?” asked Delozier. Delozier added that because Marsy’s Law would amend the Pennsylvania Constitution, once the House and Senate have passed the proposal, the final say would go to the voters via referendum. Jennifer Storm, the appointed Victim Advocate for Pennsylvania, said that while Pennsylvania passed legislation in 1995 to protect the statutory rights of victims, the lack of victim’s rights in the state’s constitution creates an imbalance of power between victim and defendants in many cases. Storm said the violation of victim’s rights includes victims or their families not being notified when their rapists, abusers, or murderers are being released from prison or considered for release by parole boards. “We will do better for crime victims in Pennsylvania,” said Storm.